This plushly pillowed loveseat has the most exceptional, long-lasting comfort and has a casual look that pairs well with all manner of room decor. Loveseat features two reclining seats and a built-in drink holder console to secure your favorite beverages. The extra-plump, fiber-filled back is channeled into a biscuit back design for soft support and an eye-catching look. This loveseat is customizable in the fabric or leather of your choosing, and can be purchased with either manual or power recline. 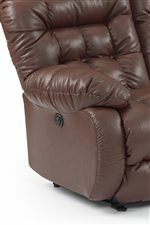 The Plusher Rocker Reclining Loveseat with Drink Console by Best Home Furnishings at Best Home Furnishings in the St. Louis, Chesterfield, St. Charles, MO & Waterloo, Belleville, Edwardsville, IL area. Product availability may vary. Contact us for the most current availability on this product. Arm Pillow padded arm rests.